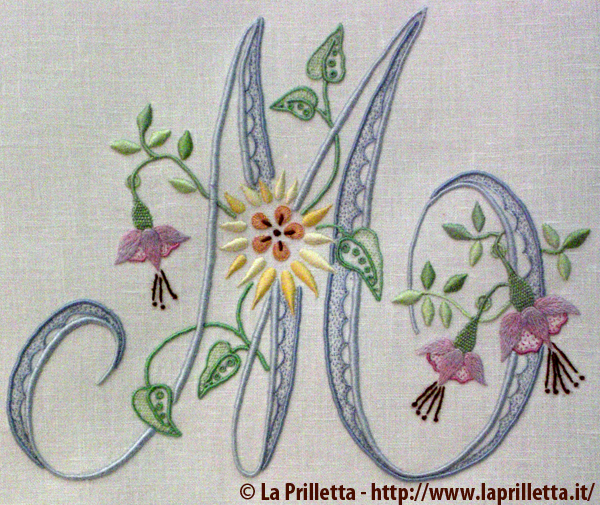 Some weeks ago, I received an email from Anna Rondelli of the Embroidery Association La Prilletta in Bologna. She asked me to take a look at her website and her work. You should too! There are photos of exquisitely delicate traditional embroidery techniques done with the utmost care and finesse. Traditional embroidery stitches like raised and padded satin stitch, shadow work, Broderie Anglais, needlepainting, cut work and drawn thread work are just some of the techniques used on fabrics like silk, organdy and fine Italian linens. 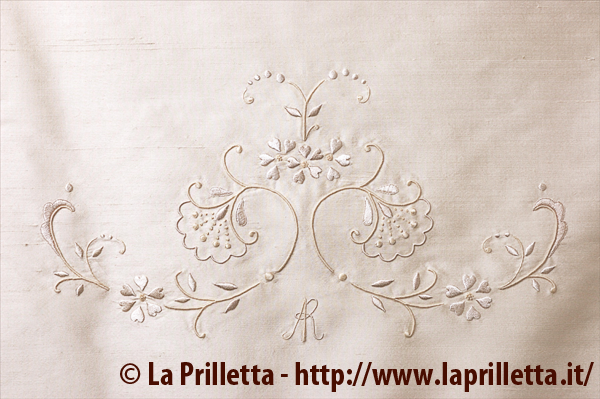 The aim of the Association La Prilletta is to rediscover and make known classic embroidery executed using a hoop which enjoyed its heyday in Bologna between the end of the 1800s and the early part of the 1900s. Anna has some of her grandmother's and great-grandmothers patterns and embroideries which she uses for inspiration along with some published designs from the period. Taking their inspiration from pieces found in family trousseaux, the Association La Prilletta works to make this embroidery technique relevant to our modern times while being faithful to its past. They practise it so it will not be lost over time and in the hopes of enriching all those who encounter it with the beauty of this embroidery. Anna herself spent 10 years learning from Vilma, a Bolognese embroidery master who attended the famous embroidery school headquartered at the Sacro Cuore Sanctuary in Bologna. This famous workshop was also renowned for the pieces of exqusite Aemilia Ars needlelace that it produced in the early 20th century. The Association La Prilletta is currently working towards their first exhibition which will fall in September of 2012 in Bologna, watch their website for more details. They offer classes in these beautiful embroidery techniques and a few didactic booklets, go to their website for more info. 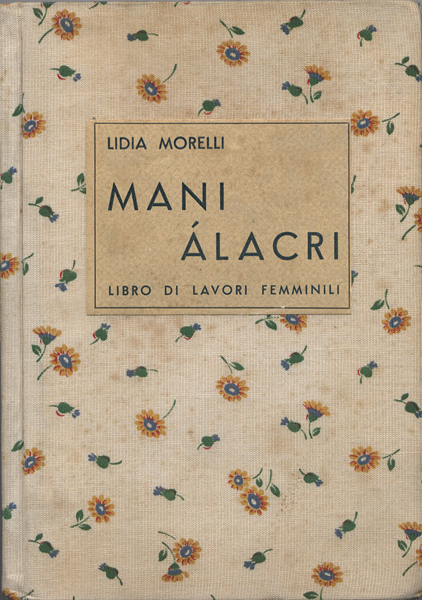 I received a lovely little book called Mani Álacri as a gift and I was curious about it's author Lidia Morelli. I did a little a research, and as it usually does, one thing leads to another and another and pretty soon what I thought would be a nice subject for a quick post turns into something you could write a good long article on. 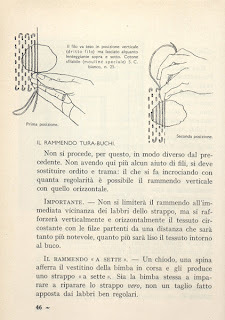 In the introduction, the author states that before writing this manual, she took a close look at the others which had come before and found that while there were lots of magazines and pattern books, there wasn't much in the way of a real and proper manual which offered technical instructions. She does quite well in just under 500 pages to provide just that. She also stresses that it is very important to teach children these techniques and that the young mind is more capable than people give it credit for. There are mostly black and white photos but there are the occasional colour plates as was normal for books of the period. 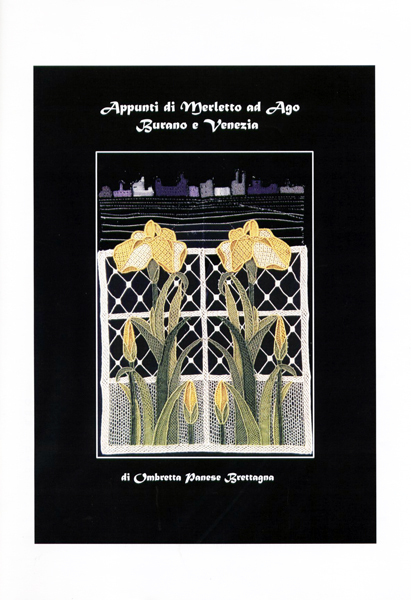 There are photos in this volume of Italian embroideries as well as traditional embroideries which are well-known to other countries but especially for the Italian works, the photos are of pieces I haven't seen in other books. As always I am fascinated by the women behind these things. 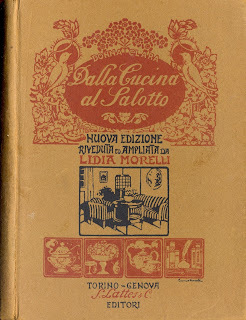 Dalla Cucina al Salotto. New Edition, 1925. Dalla Cucina al Salotto. Enciclopedia della vita domestica. Turin, 1905. Far molto con poco. L'arte di creare buoni piatti con residui di cucina. 1909. La cuoca medichessa. Un regime in cucina per ogni malattia. With Dott. Nazione. Turin, 1913. Nel paese della trina. Milan, 1914. Lavori per i nostri soldati. Turin, 1918. Storie d’inverno e di estate. Rome, 1922. Come devo comportarmi? Libro per tutti. With Anna Vertua Gentile, Milan, 1929. Massaia 900 : la cucina moderna interpretata da il capo cuoco del re. Turin, 193? La Casa che vorrei avere. 1931. La casa che vorrei avere: come ideare, disporre, arredare, abbellire, rimodernare la mia casa. Milan, 1931. 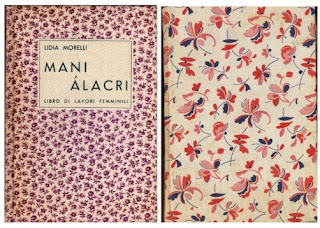 Mani Álacri. 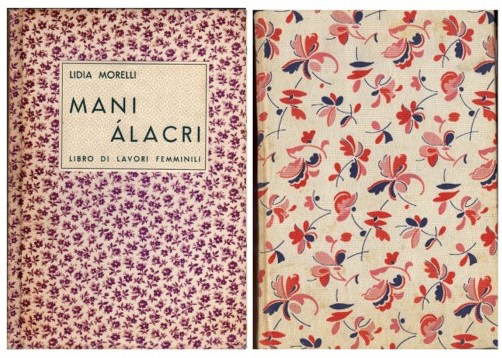 Libro di lavori femminili. Turin, 1933. Le vie del buon gusto. Milan, 1935. Massaie di domani: conversazioni di economia domestica : per le scuole secondarie di avviamento professionale a tipo industriale femminile. Turin, 1935. Nuovo ricettario domestico: enciclopedia moderna per la casa. Milan, 1935. L’arte più difficile; saper vivere con il prossimo. Milan, 1936. Le massaie contro le sanzioni. Turin, 1936. Le massaie e l'autarchia. Turin, 1937. Nuovi orrizonti per la vostra mensa. Preface only, 1937. Il lavoro della giovinetta italiana: nelle scuole secondarie di avviamento professionale a tipo industriale femminile. With Irene Faccio, Turin, 1938. Per voi massaie d'Italia. Turin, 1938. Per lui che viene. With Nello Palmieri & Maria Meschini Tursini, Rome, 1940. La vita sobria. Rome, 1941. Pentola magica P.A. brevettata. Turin, 1941. Casa nostra: trattato di economia domestica. With Erminia Macerati, Milan, 1942. Cirio per la casa 1942. Milan, 1942. Puericultura. Aggiunta al Volume: Per voi, massaie d'Italia. Turin, 1942. Vita di casa: economia domestica. Cappelli, Bologna, 1942. Casa e bambini: Conversazioni di economia domestica per le alunne della terza classe della scuola media. With Giovanni Battista Allaria, Turin, 1943. **With artwork by Enrico Montalto di Fragnito (Enrico was Lidia's nephew by her sister Dora). They are books about cooking, cooking with leftovers, cooking for illness; needlework, housekeeping, house management, childcare, etiquette, lace, jewelry, art; stories, occupations for soldiers. 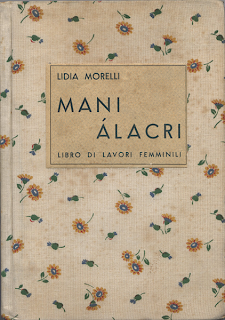 Lidia Morelli wrote articles for the Italian newspaper La Stampa. Her books were updated and reprinted many times over her long and active publishing career. She wrote for the architectural magazine La Casa Bella (which became Casabella) on Parma Embroidery and Petit Point among other topics. La Casa Bella no. 42, June 1931. 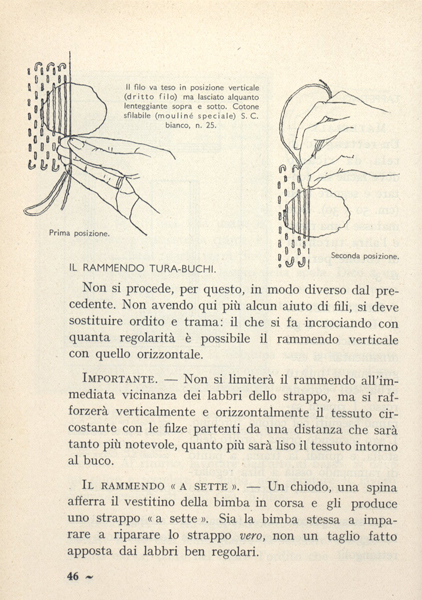 Together with Elisa Ricci, Lidia Morelli wrote the section on Embroidery for the Italian Enciclopedia Treccani. No evidence yet of a husband or children but the dedication page in my copy of Mani Álacri is a sad note to a dear "Cecilia" who seems to have died as a child. It seems to indicate that Cecilia was a niece who enjoyed needlework. "A little closed, a little reserved, a highly educated and sincerely modest woman, the soul of an artist and essentially feminine, a ready intellect to critique and tempered by an infinite goodness" (F. Sacchetti Parvis, 1929). 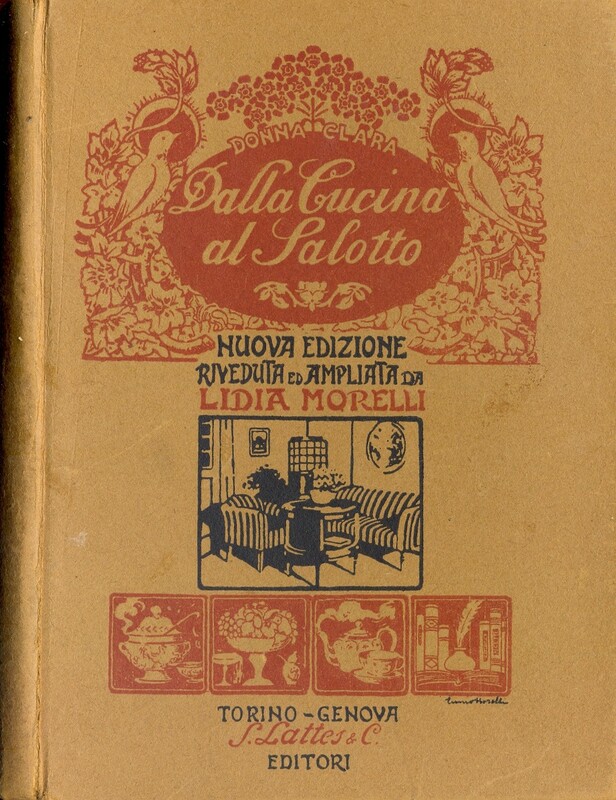 Ms. Morelli made the first steps in the field of publishing for women in 1905 with the volume Dalla cucina al salotto [From the kitchen to the livingroom]. In the thirties she was at the centre of an unquestionable success that even included the radio (G. Isola, Abbassa la tua radio, per favor [Please turn down your radio]. Florence, 1990, pg. 112). It looks like Lidia Morelli did more than one radio show or segment. 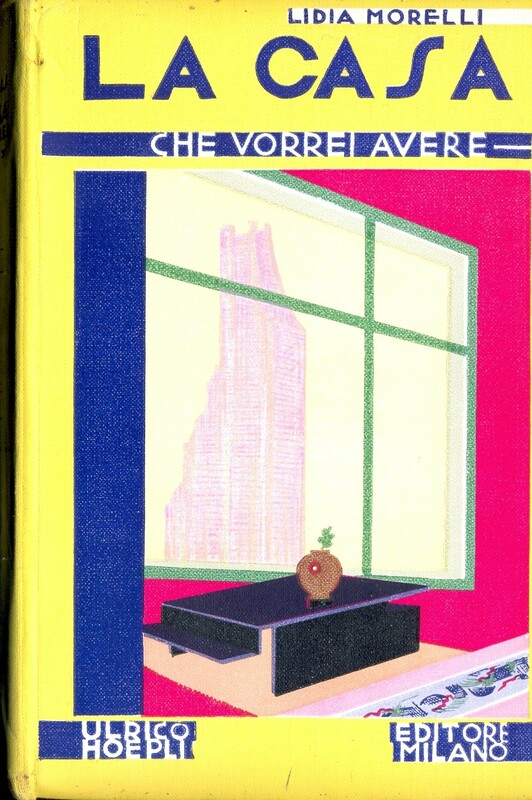 I looked up the above-quoted text on GoogleBooks but I can only see a snippet which mentions Radio Torino, a radio station in Turin, and Radiocorriere, a weekly program publication for the RAI broadcasting company. There is so much more research to do and I'll update when we find out more. A tremendous thankyou to Bianca Rosa who did lots of research for me during the snowstorms in Bologna this past winter!!! Appunti di Merletto ad Ago - Burano e Venezia. There are not a lot of books out there on the actual execution of Venetian needle lace, I mean the actual technical part, not just what the stitches look like. The booklet above is just that. The author, Ombretta Panese Brettagna made notes while participating in a course and her friends encouraged her to publish them as a bit of assistance for those who already have dabbled a bit on their own or who have taken a class here or there but are having trouble remembering little, but important, details. The text is in Italian and there are 30 pages. I asked Ombretta if I could post about her little book and she gave me permission and then told me she has her own blog. It is definitely something to check out if you are a fan of needle lace from Burano or Venice. After having completed two courses each consisting of 300 hours offered by the Region of Venice at the Professional School of the Province of Venice, Ombretta was awarded a certificate certifying her as a Needle Lace Expert. Together with some of her classmates she started a group called The Cultural Association of Venetian Lace [Associazione Culturale il Merletto Veneziano] to merge into one association, the specialties of the Venetian Lagoon: the Needle Lace of Burano and Venice and the Bobbin Lace of Pellestrina. At the bottom of this post, there is a link to a great video on YouTube about the lace of Pellestrina. You can purchase this little book at Tombolo Disegni. Il merletto di Bologna is a new non-profit cultural association started in April of 2011 with the aim of passing on and spreading the knowledge of the Bolognese needle lace technique of Aemilia Ars. They offer courses from beginner to advanced levels for learning this breathtaking needle lace. In early June of this year they will be participating in an exhibition in Bologna which will display their works. Watch their website for more details. Photo copyright: Il merletto di Bologna. 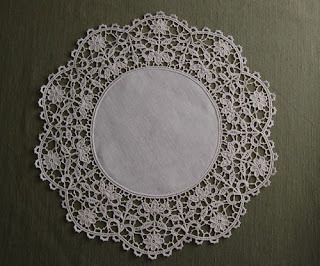 Check out their picture gallery for some lovely pieces of this lace. Since the book pictured above will be presented at the upcoming needlework show Trecce, Intrecci, Merletti that I told you about here, I thought I'd give you a sneak peak at the cover. 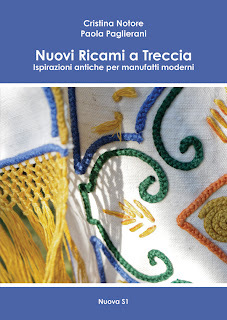 Savignano Braid Embroidery has recently enjoyed a revival, and Cristina Notore and Paola Paglierani of the TALÈA Textile Workshop have been so innovative and creative with ideas for bringing it back to life. This new publication is subtitled: Ancient Inspirations for Modern Items. You can just tell from the cover photo how much fun their new projects are going to be. In this manual, the intention of the authors is to propose a varied course which combines innovation in the revival of tradition through a selection of some 15 projects. Almost all the designs are inspired by the motifs of oxen blankets from the first part of the 20th century or are embellished decorations from ancient pottery of the same era or design stamps from the Romagna. Each project is presented with a technical pattern and a series of detailed images. The final part of the book is dedicated to the instructions for the stitches. Apart from a few tricky parts, the execution of Braid Embroidery is simple and fun and is a suitable technique for passionate beginners or those more experienced. 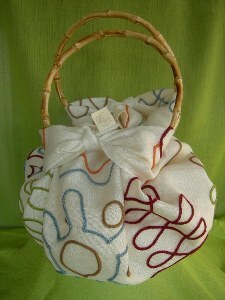 If you're going to the show on March 11th, there will be a class in this technique with a project for a bag which will be combined with the ancient Japanese art of furoshiki: the embroidered fabric is knotted around two round bamboo handles to create a seamless bag. I want to go!!!!!! Photo copyright TALÈA Officina Tessile. If you go, will you leave a comment and let us know how it was? 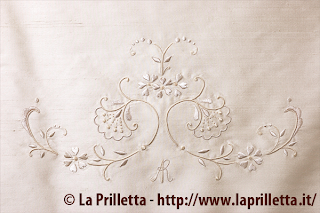 I want to show you some exquisite Casalguidi Embroideries. 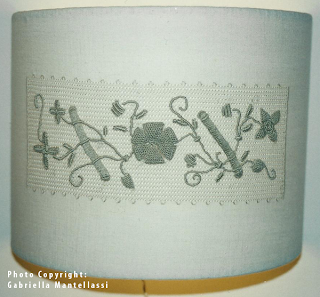 Years ago Ivana Palomba (we talked about her and her thesis on Carolina Amari in a previous post) gave courses on the embroideries of the Prato Textile Museum. Ivana taught the didactic part and a friend of hers, Gabriella Mantellassi, taught the technical part. Ivana tells me that Gabriella is a true master of this technique and has a great passion for embroidery and lace. I had the good fortune to meet Gabriella at the 2011 Italia Invita Forum in Parma, Italy and can easily agree that Gabriella is a very talented lady. 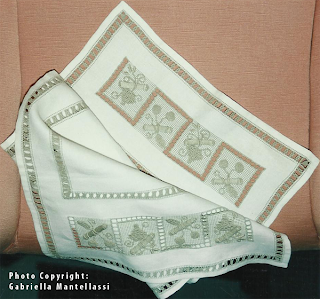 Ivana has shared (with permission) some photos of Gabriella's Casalguidi Embroideries. An intricate Casalguidi Embroidery table centre with traditional motifs. 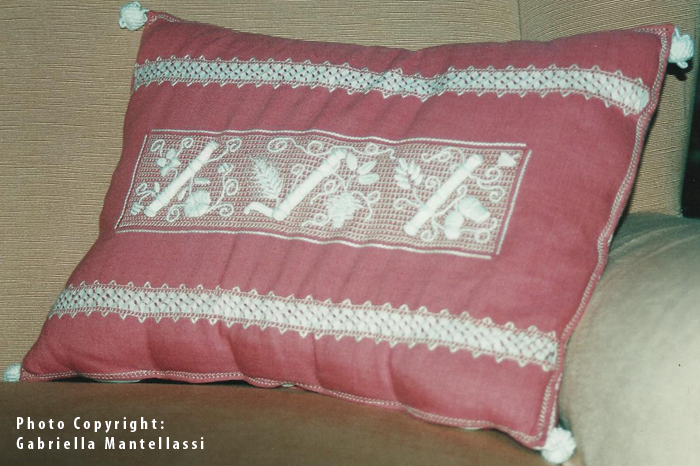 A Casalguidi Embroidery cushion with the addition of some lovely drawn thread work top and bottom. 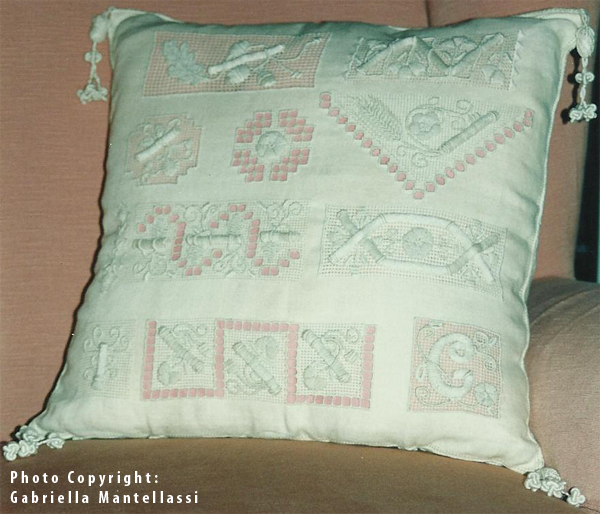 A cushion "sampler" with lots of different motifs, characteristic of Casalguidi Embroidery - notice the tassels! Creative application of Casalguidi Embroidery on a lampshade. The Prato Museo del Tessuto offers many textile-related activities and has long been on my list of places I must visit. Check out their website which has both English and Italian text. Thank you Ivana for sharing the pics and to Gabriella for the permission to publish them!